Recently operators have been adding a Bombardier CRJ700 first class to their fleet of CRJ700 aircraft. Most CRJ700 First Class configurations have 2 -3 rows of seats in a 1 by 2 configuration (6-9 first class seats). Seat Pitch for the Bombardier CRJ700 first class is usually 37 inches. Most seats are 19 to 21 inches in width for the first class seats. 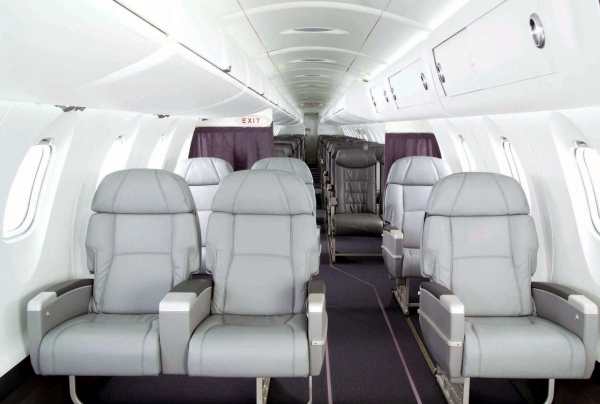 Below is an image of the standard Bombardier CRJ700 First Class interior. Above CRJ700 First Class Photo by Bombardier / Copyright Bombardier. Used under fair use. Since there are a few different names for the Bombardier CRJ700 first class, it is also referred to as the Canadair CRJ700 first class, Canadair Regional Jet 700 first class and the CL-600-2C10 first class.